Samsung has remained relatively quiet in the gaming laptop space since it first made a big splash announcement at CES 2017. Now it seems the company is ready to break its silence for a second go with the Samsung Odyssey Z 15. Samsung’s Odyssey Z 15 is a new, thin-and-light 15-inch gaming laptop featuring Intel’s new hexa-core Coffee Lake processors and a Nvidia GTX 1060 graphics chip. On top of that, the laptop features a bold new styling and dynamic cooling system. Samsung’s first gaming laptops raised eyebrows with some interesting and questionable design elements, but the Odyssey Z 15 just looks plain gorgeous. Looking at the laptop’s screen lid alone, the thick fullers (or troughs) etched into the metal give the laptop a unique and beautiful identity. Though it might seem like the top of the notebook has a ridged surface, it’s actually an illusion of the brushed aluminum finish on the flat metal. Open the laptop, and you’re greeted with an equally unorthodox form factor with its keyboard moved towards the bottom edge of the machine and a touchpad sitting off the lower right hand side. As with other similar gaming laptops, like the Asus ROG Zephyrus GX501 and Acer Predator Triton 700, Samsung opted for this design to accommodate cooling for high-end hardware. What’s more, this form factor allows the laptop to remain at a relatively small 14.78 x 10.03 x 0.71 inch (37.5 x 24.5 x 13.5; W x D x H) size and 5.3 pound weight (2.4kg). As with our past experience with other similar laptops, getting used to the Odyssey Z 15’s right-handed trackpad takes some getting used to. But, with time, you might find the desktop arrangement of the pointing device even better than its usual place on notebooks. Thankfully, the keyboard on this 15-inch machine is also a joy, as it offers plenty of travel and ‘crater’ (i.e. concave) keycaps for a comfortable typing experience. The Samsung Odyssey Z 15 also features some unique keys positioned above the trackpad to start and stop gameplay recordings on the fly. Looks aside, the Samsung Odyssey Z 15 is shaping up to be the brand’s most powerful gaming laptop yet. At the heart of this machine will be an 8th generation Intel Core i7 processor with six-cores and 12-threads. Alongside that, Samsung has integrated a Nvidia GTX 1060 graphics chip, which will promises to always deliver high-resolution graphics. To keep the system running cool, Samsung has introduced a Z AeroFlow Cooling System. The set up includes a Dynamic Spread Vapor Chamber, the Z AeroFlow Cooling Design and the Z Blade Blower. In this arrangement, the laptop’s two fans push cool air though the system to remove heat from the CPU and GPU at the same time while expelling hot air. During off load times or regular use, there’s a silent operation mode that promises to keep fan noise to a low 22 decibels. Rounding out the Samsung Odyssey Z 15’s configuration is a 1TB solid-state drive and 16GB of DDR4 RAM. There unfortunately isn’t any mention of pricing and, for the time being, the laptop will only be available in China and Korea. 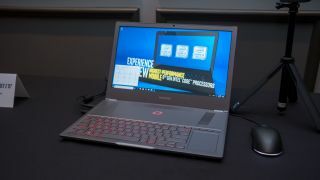 A Samsung spokesperson told us we can expect the gaming notebook to arrive stateside in the latter third of the year. The Odyssey Z 15 looks like Samsung’s most promising gaming laptop yet. With the looks of a luxury device and performance of a muscle book, this gaming laptop is looking like it will push the boundaries of what a thin-and-light machine can do. While it might seem wholly dedicated to the pursuit of gaming with dedicated streaming keys, Samsung is also keeping every day use in mind with the inclusion of a silent operation mode. The Samsung Odyssey Z 15 is still a ways from its US release, but we can’t wait to get some more time with it and will surely go into a full review with the gaming laptop then.